Perini Navi's 43m sailing superyacht Enterprise is for sale with joint central agents Bruce Brakenhoff at Perini Navi USA and Jeremy Comport at Camper & Nicholsons. Delivered in 1989, Bruce tells me that she has had only two owners and has been under the same ownership for the past ten years. With a lifting keel reducing the draft from 6.3 metres to 2.6 metres, Enterprise has the ability to transport her 11 guests to locations denied to many yachts of a similar size. She has also been immaculately maintained with major refit work undertaken in the past five years. In the spring of 2004, the engines were replaced, as were the shafts and propellers and new sound insulation was fitted. In 2007, the hull and superstructure were repainted, new sail control systems were fitted and new Bamar furling systems were provided for the yacht’s mainmast, mizzen and headsails. The same year, a customised Novurania tender was purchased as were a new suit of sails from Quantum. Internally, the galley was completely redesigned and refitted two years ago and the master cabin and all guest cabins were also upgraded. 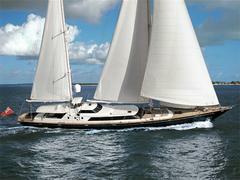 Lying in Fort Lauderdale, Enterprise has an asking price of €9 million.